“The types of actions worthy of this award include acting to protect the public’s health, safety or welfare; focusing public attention on important potential impacts of science and technology on society by their responsible participation in public policy debates; or providing an exemplary model in carrying out the social responsibilities of scientists, engineers or in defending the professional freedom of scientists and engineers. Dr. Sarath Gunatilake,2 professor of health science at the University of California, whose areas of expertise includes occupational and environmental health research. Channa Jayasumana, Ph.D.,3 a faculty member of Medicine and Allied Sciences at the Rajarata University of Sri Lanka, who conducts research into nephrotoxins (kidney toxins) and the causes and treatments for chronic kidney disease. Their paper “Glyphosate, Hard Water and Nephrotoxic Metals: Are They the Culprits Behind the Epidemic of Chronic Kidney Disease of Unknown Etiology in Sri Lanka?”4 was published in 2014, followed by “Simultaneous Exposure to Multiple Heavy Metals and Glyphosate May Contribute to Sri Lankan Agricultural Nephropathy,”5 and “Drinking Well Water and Occupational Exposure to Herbicides Is Associated With Chronic Kidney Disease in Padavi-Sri Pura, Sri Lanka,”6 in 2015. In the third paper listed, the team found people who drank water from wells where glyphosate and heavy metal concentrations are higher had a fivefold increased risk of CKDu. Jayasumana, meanwhile, provided testimony8 at the yearlong International Monsanto Tribunal,9 which began December 2015, asserting that glyphosate use has resulted in ecocide. “Folta’s claim that there are ‘no data’ in the paper is false. There are plenty of data in this and the authors’ follow-up papers — from epidemiological and case-control studies, as well as geographical surveys — that support the idea that glyphosate herbicides should be withdrawn from use as a precautionary measure until they can be proven safe. Should Scientific Freedom Award Be Revoked Based on Controversial Findings? True, Gunatilake and Jayasumana’s theory is just one of dozens of hypotheses for what might be causing chronic CKDu.17,18,19 (Cadmium toxicity is on that list, though.) Overall, it doesn’t appear as though any one given influence can explain all, or even most, cases of CKDu, so the search for answers continues. “A strong association between the consumption of hard water and the occurrence of this special kidney disease has been observed, but the relationship has not been explained consistently. Here, we have hypothesized the association of using glyphosate, the most widely used herbicide in the disease endemic area and its unique metal chelating properties. “The AAAS has a mixed record when it comes to public interest issues. In 2013 the AAAS’ board of directors issued a statement opposing the labeling of GM foods in the U.S. … The AAAS was at the time chaired by Nina Fedoroff, who has close ties to the GMO industry. While glyphosate-based herbicides still dominate the global market, rapidly mounting weed tolerance has led to the introduction of dicamba-based herbicides and a new crop of genetically engineered (GE) plants designed to withstand it. Dicamba is an incredibly potent toxin, and dicamba drift damaged or destroyed an estimated 3.6 million acres across the U.S. between 2016 and 2017 alone. This included not only fields growing non-dicamba-resistant crops but also trees. In response, the U.S. Environmental Protection Agency placed some restrictions on dicamba usage. For instance, special training is required to apply the herbicide, and its application is prohibited when wind speeds are greater than 10 mph. Farmers are also asked to assess the risk that spraying could have on nearby crops, as well. Despite this, reports of damage from dicamba drift continued through 2018. What’s worse, many farmers report feeling they have no choice but to buy Monsanto-Bayer’s GE dicamba-tolerant seeds, or else they risk having their crop destroyed by dicamba drift from their neighbors. “[D]icamba fumes from fields of Xtend soybeans have curled up the leaves of sycamore trees and millions of acres of traditional soybeans across much of the Midwest and South. Brazel wasn’t willing to take the risk of that happening to his crops. In some parts of the U.S., protecting your crop from dicamba damage from neighbors is part of the sales pitch for the dicamba-resistant Xtend soybeans, NPR reports. In response to this mounting pressure to switch or lose your farm, a lawsuit has been filed against Monsanto on behalf of farmers, arguing the dicamba-tolerant seeds violate antitrust law. As noted by NPR, “The lawsuit claims that the company understood that the risk of drifting dicamba could drive competitors out of the market.” Bayer (which bought Monsanto in May, 2018) has asked for the lawsuit to be dismissed. A decision from the court is still pending. The sad fact of the matter is, if you’re eating nonorganic foods, especially processed food, then you’re eating glyphosate on a regular basis. Farmers apply nearly 5 billion pounds (over 2 billion kilograms) of glyphosate to farm crops each year, worldwide.32 Approximately 300 million pounds are applied on U.S. farmland. 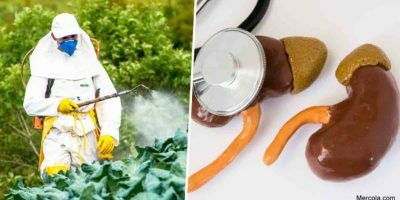 Testing has revealed 70 percent of Americans had detectable levels of glyphosate in their system in 2016; between 1993 and 2016, the glyphosate levels in people’s bodies increased by 1,208 percent.33A recent investigation by journalist Carey Gillam34 revealed Roundup has been found in virtually all foods tested, including granola and crackers. Glyphosate actually has a glycine molecule as part of its structure (hence the “gly” in glyphosate). Glycine is a very common amino acid your body uses to make proteins. As a result, a senior scientist at MIT, Stephanie Seneff, Ph.D., believes your body can substitute glyphosate for glycine, which results in damaged proteins being produced. The chemical has also been linked to an increased risk of Non-Hodgkin lymphoma and lung cancer.38Considering the possible dangers of glyphosate, it would make sense to minimize your exposure, and if you have high levels already, to take steps to detoxify it. HRI Labs has developed home test kits for both water and urine, and if you have elevated levels, you can drive out the glyphosate by taking an inexpensive glycine supplement.